The C34 is a brand new model for 2013 for this well known manufacturer based in Pulaski, Wisconsin, a boat builder for nearly sixty years. 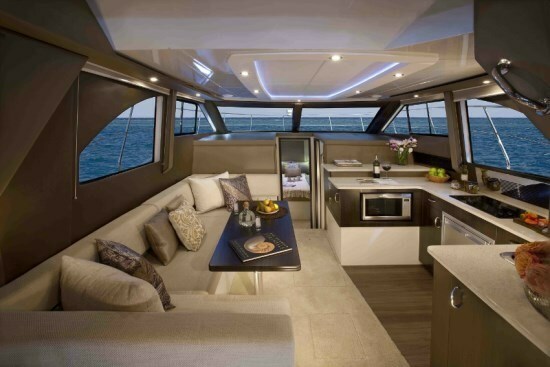 It is one of eight flybridge and command bridge models in its lineup from this, its smallest right up to the 54 Voyager flagship. The C34 is a bright and roomy bridge boat with large surrounding salon windows and double opening glass doors from the cockpit into the salon. A wide fiberglass molded staircase leads from the cockpit to the huge command bridge. Again, from Carver, “The new Carver C34 is the essence of a Carver Yacht, merging durability and space with modern convenience and efficient design.” Let’s check this out. 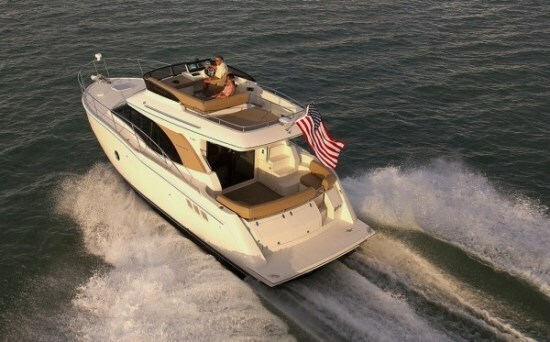 The standard equipment list on the C34 provides you with most of the important amenities you would ever need for cruising and entertaining, but it is in the wide selection of options which allows you to choose those specific items to personalize this boat to your own tastes and preferences. An integrated swim platform leads to the cockpit through a starboard side transom door. Two storage lockers are accessed from the platform on the aft side of the transom. 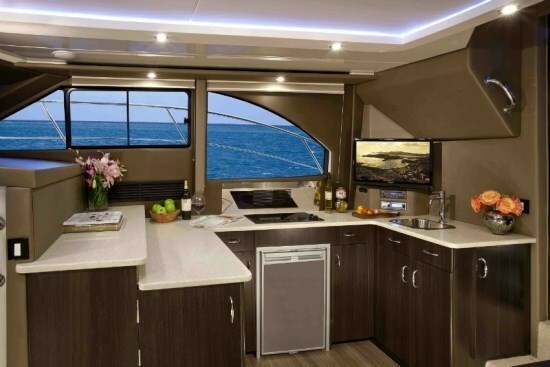 You can leave the large cockpit area free of any accessories or choose to equip it with an L-shaped transom lounge to port with a single starboard side seat, your choice of either a refrigerator or ice maker, a table, and snap-in carpet. A hot and cold transom hand shower is optionally available as is a fresh water or salt water (or combination of both) transom washdown. Through the glass doors and three steps down, you will find the interior of the C34 comes pretty standard without a lot of available options. The salon is open and bright with screened opening side windows and a large convertible U-shaped upholstered lounge to port complete with a dining height table. Salon flooring is plush pile carpeting as are both staterooms. Opposite, the starboard side of the salon is almost completely filled with a massive U-shaped galley and entertainment centre with loads of storage. Flooring here is “Dusky Walnut” vinyl plank. A microwave, two-burner electric cooktop, and 3.8 Cu. Ft. refrigerator are standard as is a 24” LCD TV, DVD player, and AM/FM/CD stereo. Single or dual zone reverse cycle air conditioning/heating is optionally available as is a complete lower helm station. If you choose this latter, it and the double-wide helm seat that comes with it eliminate the forward section of the galley unit. 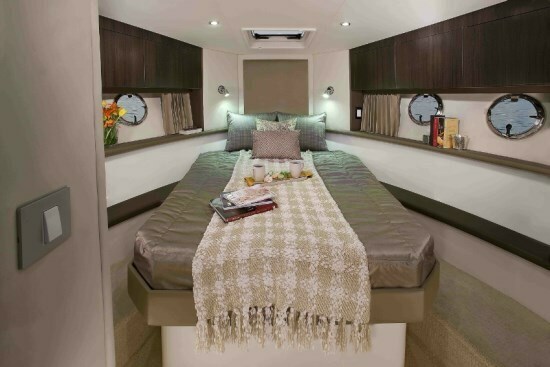 The forward master stateroom offers an island berth with comfort foam mattress, dual end tables, dual storage lockers, and dual hanging lockers. The starboard side guest stateroom provides twin berths with comfort foam mattresses. Both staterooms are entered through hinged, wooden, lockable doors. Spruce up these rooms with Carver embroidered fitted sheet and towel sets. Add a 19” LED/LCD TV with DVD player in the master. 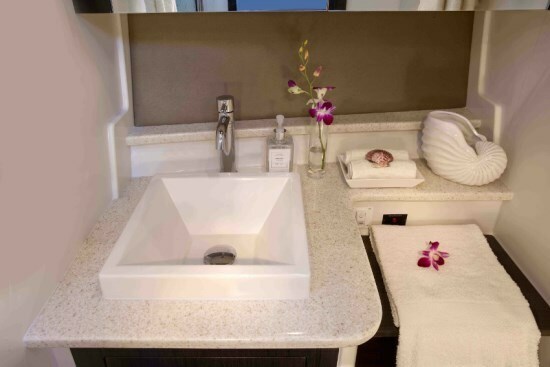 The portside head provides a Raritan® electric pedestal toilet, vessel sink and separate shower with a bench seat and acrylic door. Up on the command bridge, the swivel adjustable, starboard side helm chair is located virtually amidships for great all-round visibility. U-shaped surround seating with storage below plus an aft sunpad fills the balance of the bridge area. A bridge table is available. 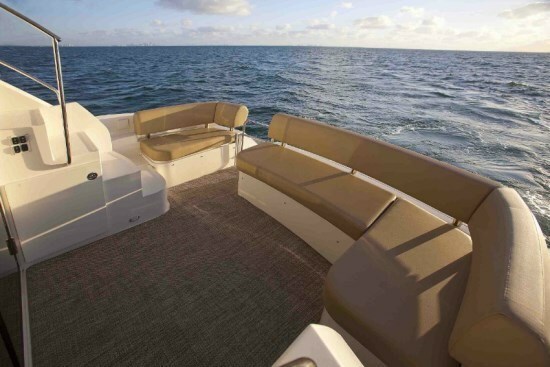 All canvas is optional from a bimini top to full bridge enclosure with or without seat covers. Snap-in carpet is also available. Standard power is by twin Mercury 5.7 litre inboard V-drive gasoline engines. Twin Volvo Penta D4 diesel power is optionally available with or without the optional Xenta® joystick control which integrates these diesels with bow and stern thrusters. Separate bow and/or stern thrusters without the joystick control are available with either the gasoline or diesel power. Also choose a Kohler® gasoline or diesel generator, remote spotlight, ground tackle including a windlass, and Raymarine® electronics and navigation packages. “The C34 began as a clean sheet of paper which gave us the ability to incorporate the most advanced and efficient building techniques while continuing to maintain Carver quality throughout.” Check this out for yourself.